My best advice? 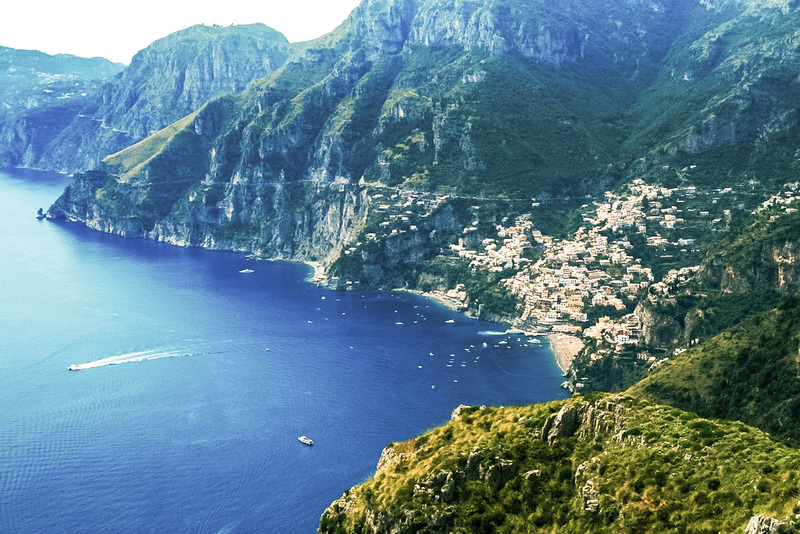 To make the most of your Italy summer holidays, head for the coast, lakes, or mountains. Italian cities swelter and swell with tourists during summer months. 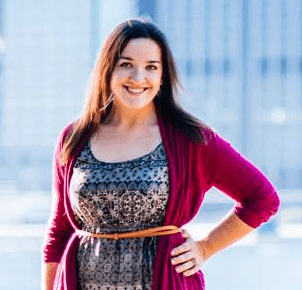 Do you really want to be standing outside in the sun in 100+ degree weather waiting for an hour to get into the Duomo or Accademia in Florence, or elbowing your way through tourists in St. Mark’s Square in Venice? I did all this last summer in Italy, so let me save you the trouble and tell you that it’s pretty much zero fun. 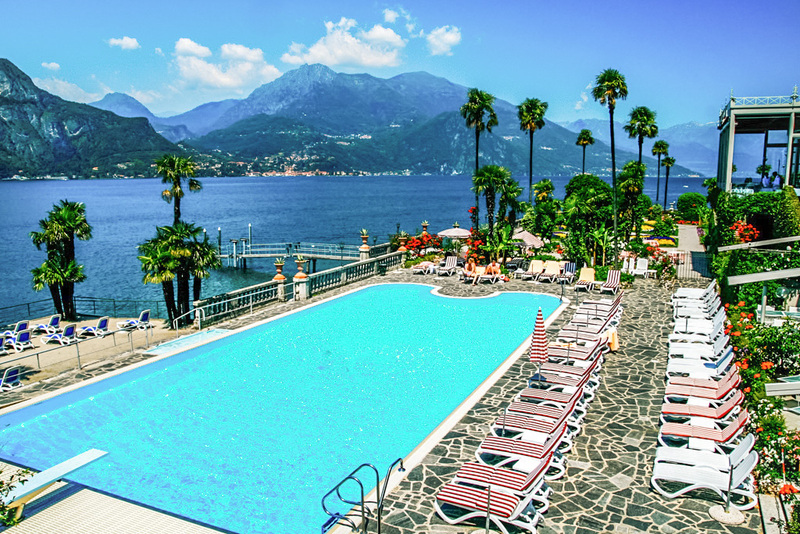 If you head for the water instead during the Italy summer, you’ll have breezes and swims to look forward to. Or if you opt for the mountains, you’ll get to enjoy cooler nights. Not to mention some pretty epic landscapes. 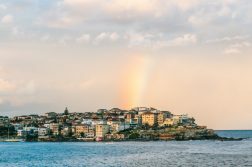 Many of these seaside, lakefront, or alpine spots are swarming with tourists during Italy summer because they’re gorgeous and absolutely epic. I don’t know about you, but if I’m going to be battling crowds, I’d much prefer to do so with beautiful scenery as well as options for cooling off from the heat. 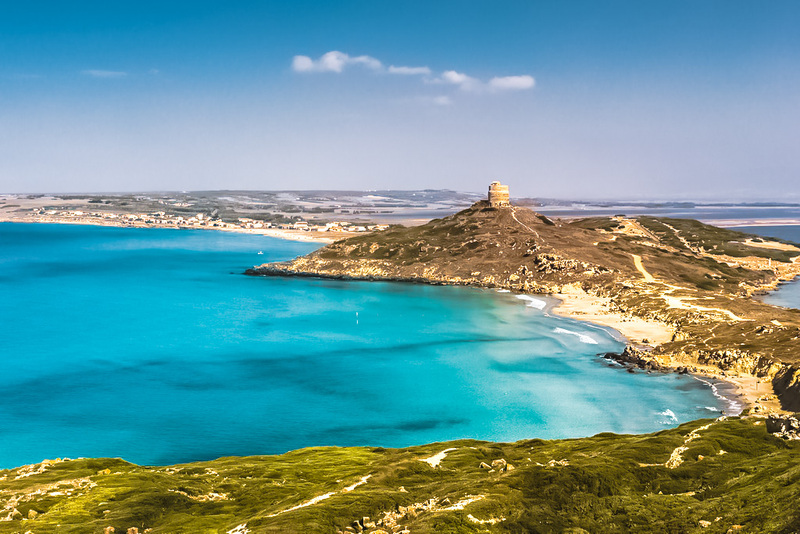 Most people advise against hitting this coastal hotspot during your summer holiday in Italy because of how hugely popular it’s become. I, however, am not most people – and in fact, I think that summer is actually the best time to visit Cinque Terre. Summer in Cinque Terre means a swell in visitors across all 5 villages which can feel like an absolute zoo in a sweatbox. But that’s if you’re out during the day, smack in the center of town where most of the shops and restaurants are. You can easily avoid the crowds and the heat by doing your wandering early in the morning, or from late afternoon onwards when most people have gone back to their hotels to get ready for dinner (and then go out for said dinner). 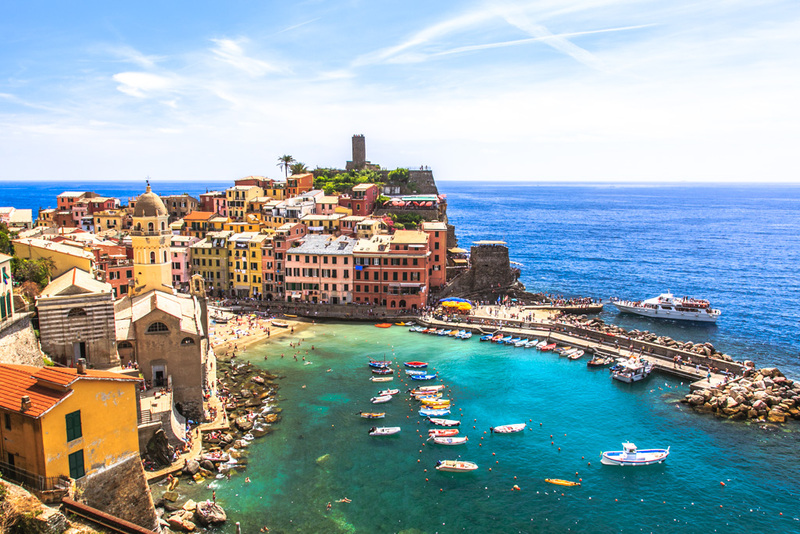 Cinque Terre: one of the best places to visit in Italy in July or August. Better yet, head to the water during the day! 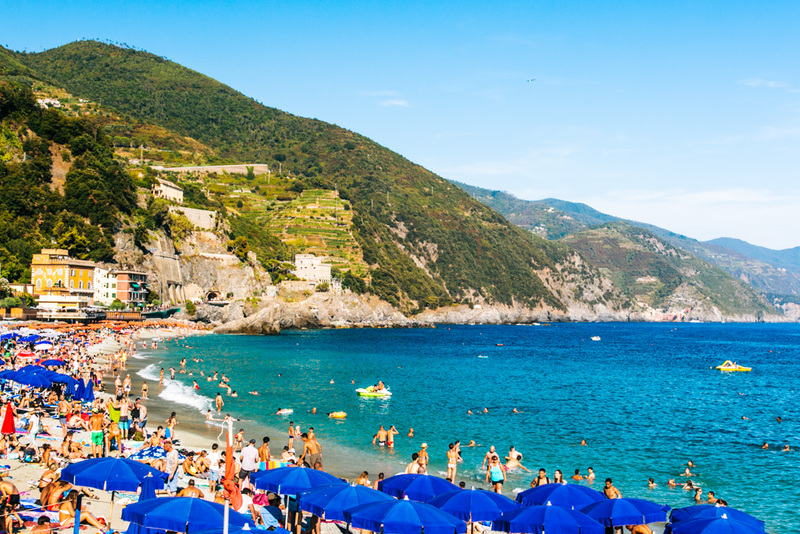 Part of the magic of Cinque Terre is its beautiful coastline, so don’t be afraid to get all up in it. Only a small fraction of tourists will actually be sunbathing or swimming at any given time, but when it’s 80+ degrees out I don’t know why you’d want to be doing anything else. 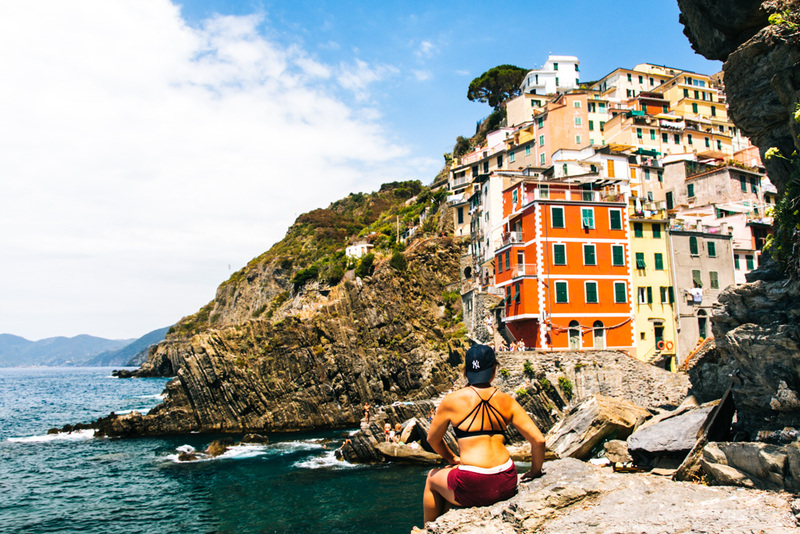 Rent a beach chair and sip on an aperol spritz at Monterosso al Mare, hike down to the secret beach at Corniglia, go cliff jumping at Riomaggiore, or hop into the water at Manarola and gaze back at the colorful facades in town. Frugal Tip: The cheapest accommodation in Cinque Terre is at Ostello di Corniglia at €24/night. Also, it’s worth investing in a multi-day Cinque Terre Card so you can take the train between all the villages as often as you’d like. Individual train rides are quite pricy, so the card will quickly pay for itself. 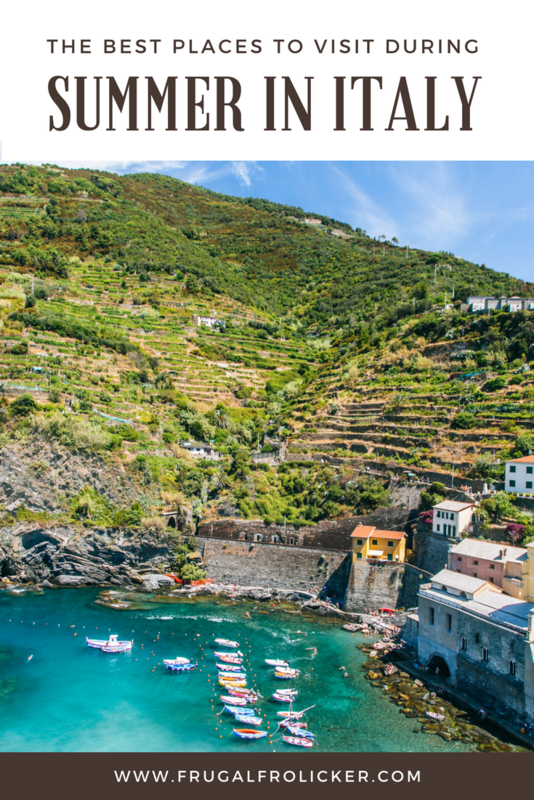 READ MORE: Is it Worth Visiting Cinque Terre in Summer? Mention the Amalfi Coast and one’s mind likely conjures up an image of Positano, complete with pastel-colored buildings tightly-packed into tiers that lead from the cliffs down into the sea. It’s the scene of postcard dreams. Positano’s amazing, but don’t forget to check out nearby Amalfi and Atrani, or the smaller villages along the coast. 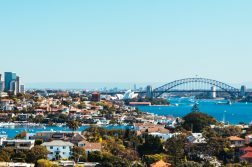 All of them have spectacular coastal views and some form of beach, whether it be sand, pebbles, or a platform on the water. I don’t know about you, but I’d much rather spend my summer holiday in Italy under one of those colorful umbrellas that line pretty much every Mediterranean beach, than sweating my tail off with little respite in Rome or Florence (been there, done that, never again!). The Amalfi coast is definitely the place to be! 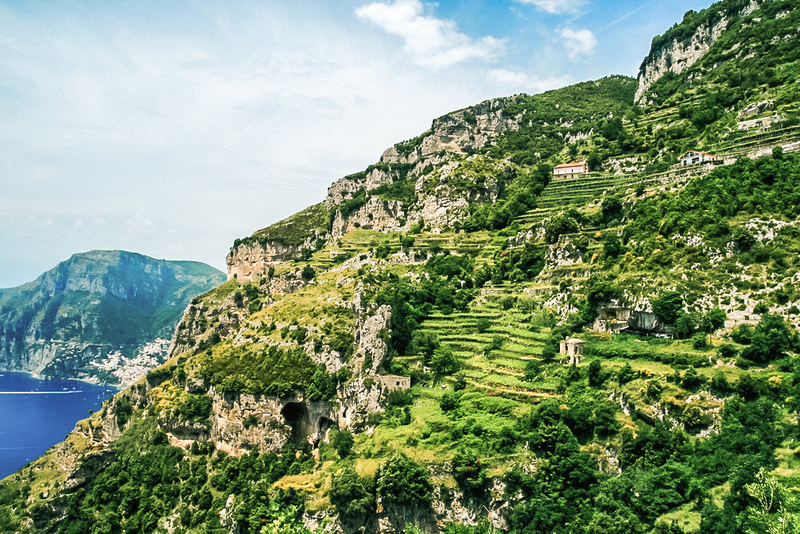 Frugal Tip: For some free fun + fitness, hike the Sentiero degli Dei (Path of the Gods), or one of the other trails that lead through the coastal villages. 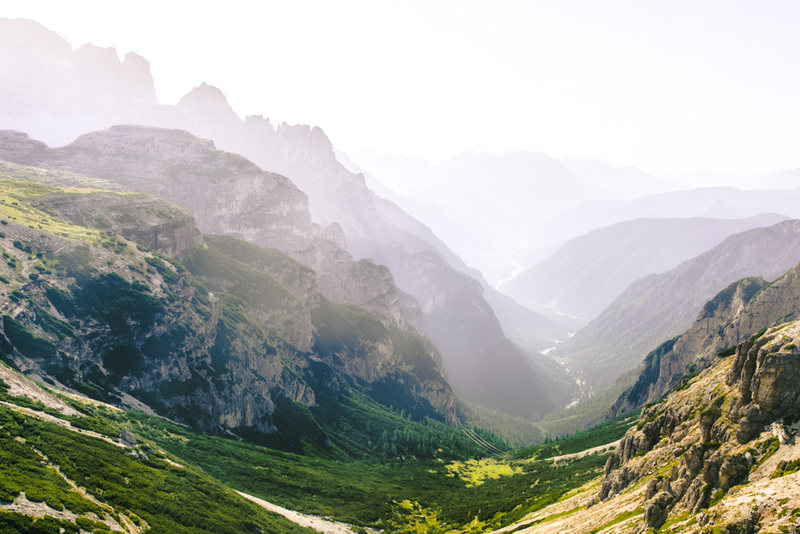 The Dolomites: one of the best places to visit in Italy in summer. While most of Italy absolutely swelters during summer months, the mountainous South Tyrol region in the far north of Italy is much more tolerable with daytime temperatures typically in the 70’s, and nights cool enough to require at least a light jacket or sweater. It’s definitely where you should focus your summer holiday in Italy if avoiding heat and/or tourists is top priority. The start of the Tre Cime hike. 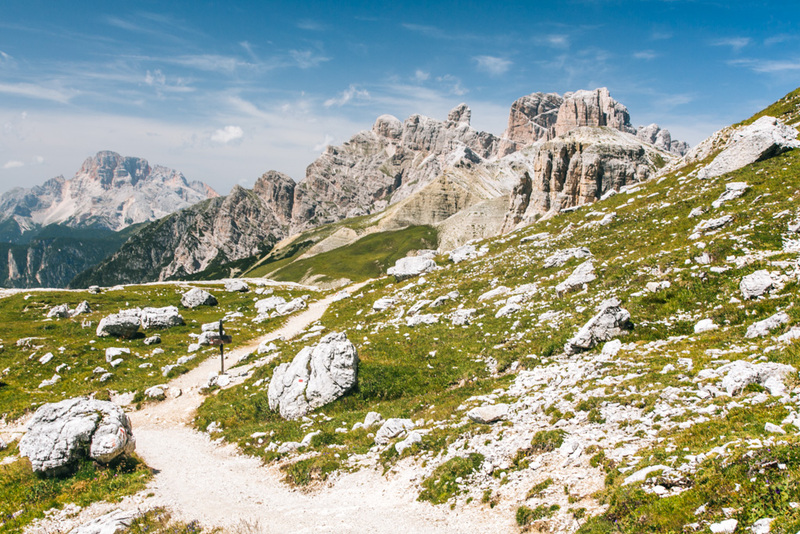 Hike the Tre Cime di Lavaredo trail. 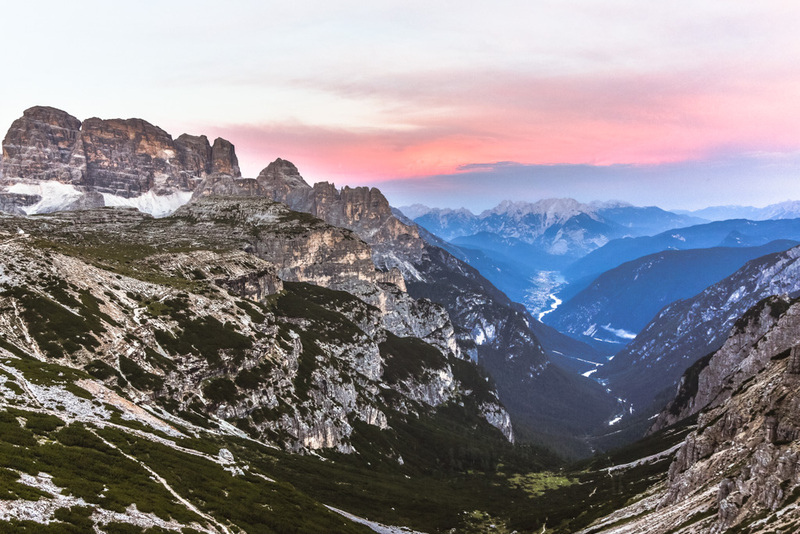 Base yourself at Rifugio Auronzo and you’ll be able to get an early start to one of Italy’s most popular day hikes. Otherwise, stay in the beautiful town of Auronzo di Cadore nearby. 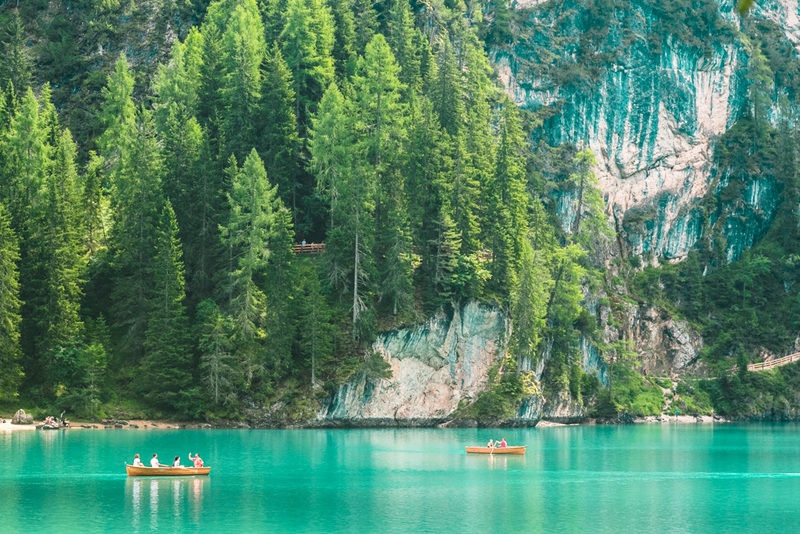 Visit the insta-famous Lago di Braies. Getting photos of the rowboats in front of the mountains around sunrise is the trendy thing to do, but the lake shines bright teal blue around midday and is perhaps even more stunning at this time. Tackle a “via ferrata” route. Hiking and rock climbing combine for a thrilling alpine adventure, where you attach yourself to an iron cable in order to stay safe while traversing the route. Explore some of the Tyrolean towns. Admire the mishmash of German and Italian throughout the region, with most signs written in both languages and more South Tyroleans speaking German than Italian. Many of the homes and hotels look like they were plucked right out of Austria! Frugal Tip: Rent a car to maximize your options for exploring the region. There are trains and buses that run through it, but you won’t be able to cover anywhere near as much ground if you rely on public transport. Not into mountain hikes or hot weather? Northern Italy still has you covered if you stick to its stunning lakes region instead during summer in Italy. Drive or take the train about an hour north of Milan and you’ll reach the bottom-most points of Lake Maggiore and Lake Como. 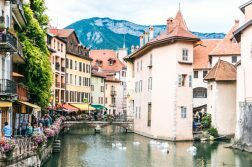 Both have adorable little towns around them that make for an ideal base from which to explore the lake (recommended: Varenna or Menaggio on Lake Como, Stresa on Lake Maggiore). Apart from relaxing and frolicking down cobblestone alleys, definitely take a breezy boat trip around the lake in order to thoroughly admire the gorgeous scenery, and cool off with a dip in the lake or the pool (if your accommodation has one). 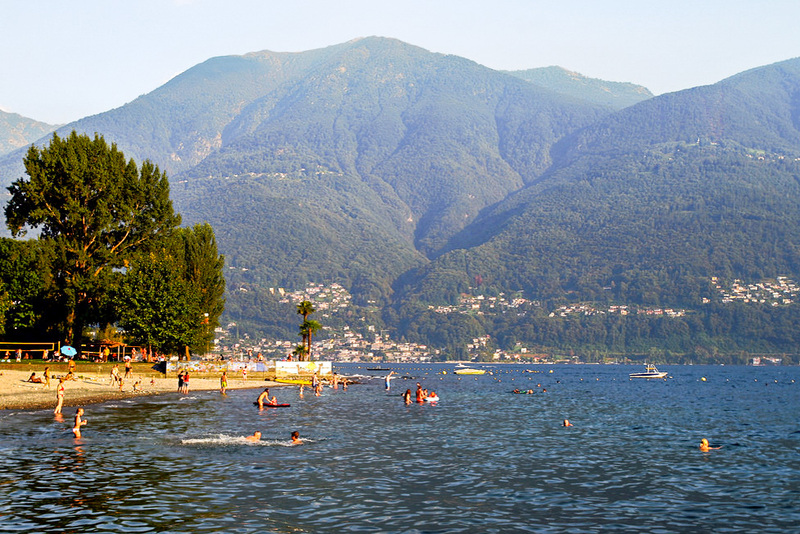 Lake Maggiore: one of the best places to visit in Italy in July and August. Frugal Tip: The lakes are super easy to reach by train from Milan and the journey takes about the same time as it does by car. There are ferries and buses that operate around the lakes, so you’re able to explore plenty without having to drive. 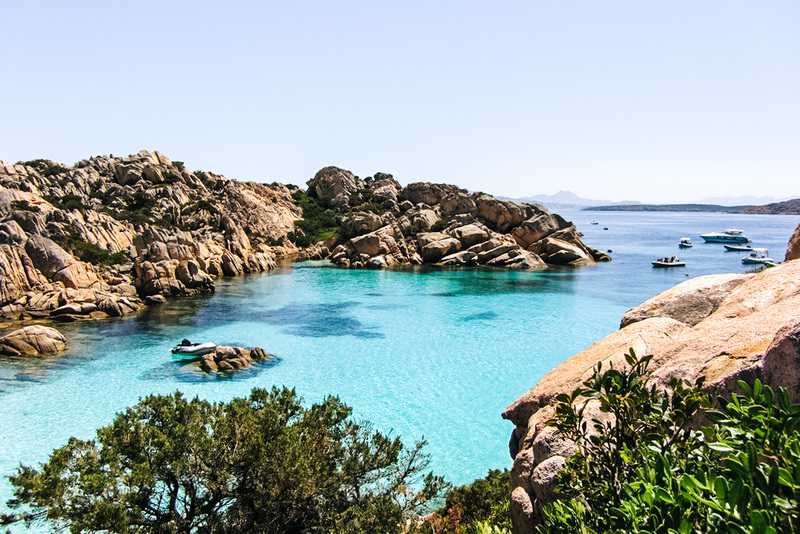 It may not be a must-do for most people planning a trip to Italy for the first time, but Sardinia is hugely popular amongst Italians as a summer getaway. This rather massive island sits off the west coast of Italy and is known for its glorious white sand beaches (aka my favorite thing in life and why have I not yet been to this magical place?!). Photo by berlinrider via Flickr Creative Commons (edited by me). It’s a cinch to escape the crowded beaches by seeking out the quiet coves and villages along the island’s 1800km of coastline, or by exploring the other little islands nearby by boat. Think granite boulders and limestone cliffs cascading into the bright blue sea. Photo by Federico Lorenzini via Flickr Creative Commons (edited by me).